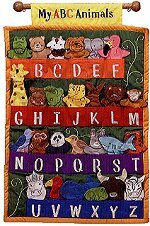 A is for Alligator, B is for Bear, C is for Cow... Learning the alphabet has never been so much fun as it is with this My ABC Animals cloth wall hanging. In addition, each animal is a finger puppet for even more imaginative play. This adorable soft sculpture educational My ABC Animals wall hanging comes with beautifully embroidered and/or printed cloth pieces to help make learning an interactive delight.